“Believe me, you’ve actually helped me more than you know in getting my act together so thank you very much.” Tim Burton said in jest to MoMa staff members at this week’s Press Preview of his upcoming exhibition simply titled, TIM BURTON. And yes, Tim Burton still creates art. How could he not? After spending several days at MoMA last spring, he created multiple sculptures for the exhibition. Some are familiar. Some not. All are breathtaking. Kudos to MoMA for recreating Burton’s creative life. 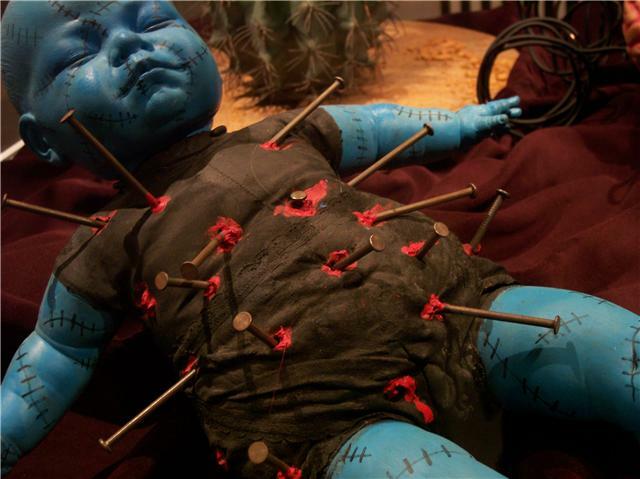 Their success is a stunning achievement, but really the exhibition is just fun for both adults and children. Don’t leave the kiddies home for this one. They’ll have a great time. 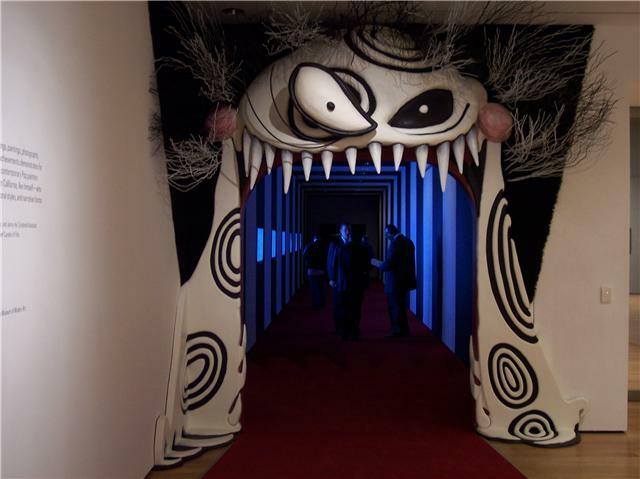 Entrance to the gallery is through the mouth of a black and white striped hairy beast…the light is dim…the floor red. At the end of the hallway and around a corner is Burton’s 1st new sculpture…a hanging carousel found only in your dreams…in a room with black light paintings. And that’s just the beginning. Burton’s entire career is examined from a 1970’s junior composition paper to ALICE in WONDERLAND artwork. 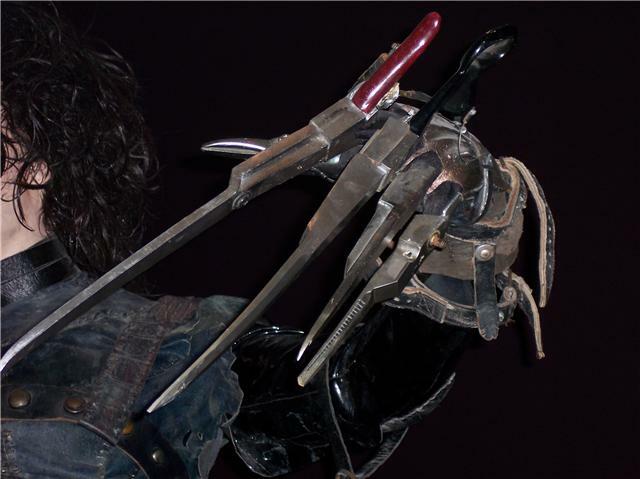 Some highlights include a lifesize Edward Scissorhands; Ed Wood’s angora sweater; severed heads from SLEEPY HOLLOW; a Stainboy sculpture; Sweeny Todd’s razors; and Burton’s first films made in his own backyard. And, yes, his oversized Polaroid collection is included. Jenny He, Curatorial Assistant, Department of Film, said “Burton’s 1992-1999 still life Polaroid project resulted from escaping out to the desert as a relief and release from his day job as director of fairy tales and fables and German Expressionism.” Boy, that sure puts a whole new take on living for the weekend. And we thought it was just the everyday worker…What a relief. So Mr.Burton do you have any thoughts on the exhibition? But Tim how do you really feel about it? Well said, Mr. Burton. Well said. A final note. The New York Exhibition runs 11/22/09 – 4/26/10. TIM BURTON will then travel to the Australian Center for the Moving Image, Melbourne in June 2010 and then on to Canada at Toronto’s The Bell Lightbox in November 2010. I’m sure you will agree, a great article by regular Live for Films reporter/researcher Pamela. This entry was posted on November 19, 2009 at 8:20 pm	and is filed under Art, Fantasy, Film, news, Review. Tagged: Art, Johnny Depp, MoMA, news, Review, Tim Burton. You can follow any responses to this entry through the RSS 2.0 feed. You can leave a response, or trackback from your own site. Dang. It isn’t very often that I wished I lived in NYC, but this is one of those times. To be able to just take in the exhibit any time would be cool. This is one I would love to see.